× Super K with Advanced K2 Complex has successfully been added to the list . You will be Adding Super K with Advanced K2 Complex to the list . Super K with Advanced K2 Complex provides THREE kinds of vitamin K: vitamin K1 and two unique forms of K2, menaquinone-4 (MK-4) and menaquinone-7 (MK-7). 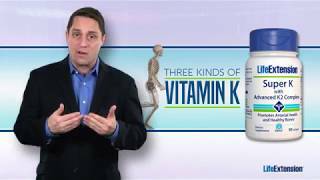 These three unique vitamin Ks make Super K our best stand-alone vitamin K supplement for bone and arterial health. 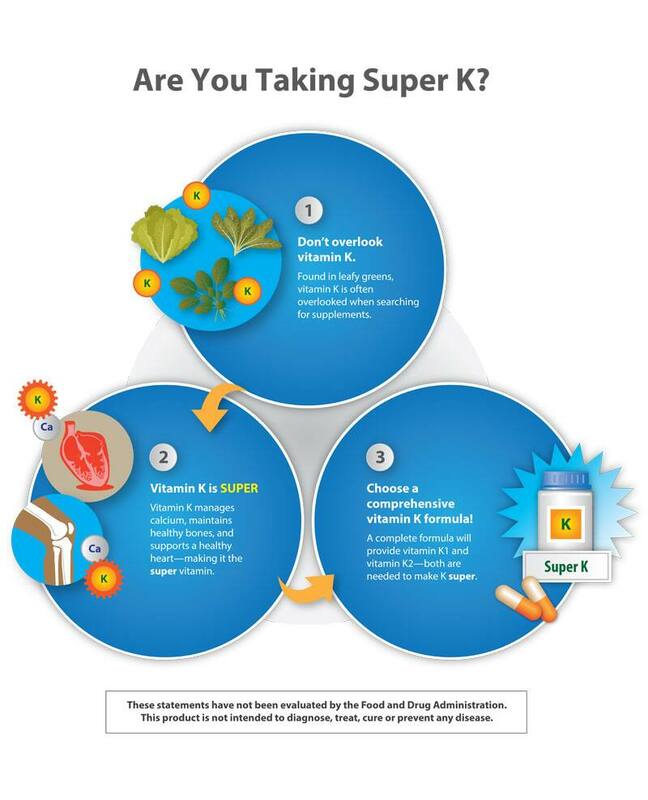 So make sure you’re getting enough vitamin K: take Super K with Advanced K2 Complex every day! Vitamin K helps maintain your body’s calcium balance, which affects everything from arterial health to bone density. But it’s hard to get sufficient vitamin K from food. So a vitamin K supplement is a good idea … and Super K is the best stand-alone vitamin K supplement we offer. The MK-4 form of K2 is the most rapidly absorbed type of vitamin K. However, it only lasts in the bloodstream for a few hours.11 The MK-7 stays available in your body up to 48 hours, and at much higher levels.9,10 And our MK-7 is made from a unique bio-fermentation process. Just one daily softgel of Super K with Advanced K2 Complex provides 100 mcg of vitamin K2 (MK-7); 1,000 mcg of vitamin K2 (MK-4); and 1,500 mcg of vitamin K1. Try this excellent way to get your vitamin K today! J Nutr. 2004 Nov; 134(11): 3100-5. J Nutr. 2017 May; 147(5): 888-95. Am J Clin Nutr. 2009 Jun; 89(6): 1799-807. Osteoporos Int. 2013 Sep; 24(9): 2499-507. Haemostasis. 2000 Nov-Dec; 30(6): 298-307. Blood. 2007 Apr 15; 109(8): 3279-83. Nutr J. 2012 November 12; 11(1): 93-7. Adv Nutr. 2012 March 1, 2012; 3(2): 182-195.